In a peaceful secluded location a stone's throw from the sea, Hotel Villa Margherita is a quiet haven for a regenerating relaxing break and a perfect base for exploring the marvels of the Costa Smeralda. Hotel Villa Margherita stands in the lively resort of Golfo Aranci, with picturesque fishermen's cottages lined up along the coast, backed by Capo Figari. The presence of the port makes this small town one of the gateways to the Costa Smeralda, and contributes to the welcoming spirit of its people. A beautifully appointed 4-star hotel just a few steps from the sea, Villa Margherita offers its guests all they need for a regenerating and fully relaxing holiday: the pleasant scents of the lush Mediterranean garden, the irresistible appeal of the sun-kissed pool, and fiery sunsets on the sea of Golfo Aranci. Hotel Villa Margherita is a welcoming haven and a perfect base for exploring the surrounds: the ancient Nuraghic sites of Gallura, the white sand beaches of the Costa Smeralda and, literally round the corner from the Hotel, the colourful daily life of the fishermen's village. 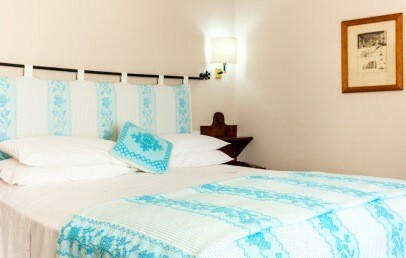 Recently renovated, the hotel's 41 rooms are furnished in the traditional Sardinian style, in soft pastel tints. 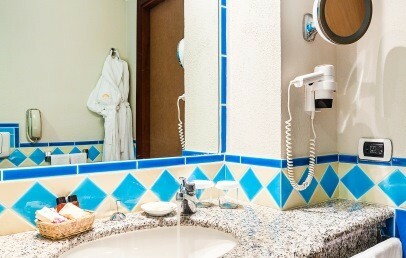 All rooms overlook the bay and are provided with Wi-Fi connection, air conditioning, satellite TV, minibar, safety box and hair dryer. 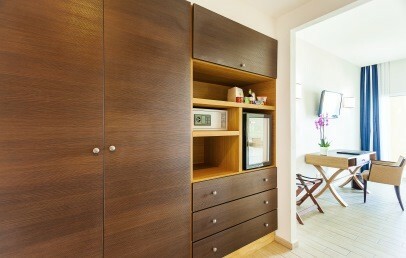 Junior Suite – 50 sq.m., queen-size bed, living room with sofa bed, balcony, panoramic view, tub or shower. The boutique Spa is a soothing space devoted to body and mind wellness. 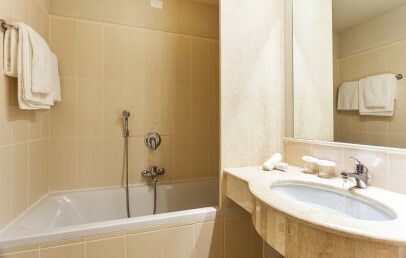 The centre makes available to guests: hydro-massage tub, Turkish bath, gym and a wide range of treatments and massages. The Grill restaurant offers the best recipes from the Region's food tradition, giving pride of place to the delicious locally caught fish. You will enjoy candlelit dinners with a view of the sea accompanied by the cool breeze of the Gulf, in a refined and relaxing atmosphere. The Sunset Bar, on the hotel's terrace, will enable you to sip a poolside cocktail or enjoy a tasty snack in the garden. 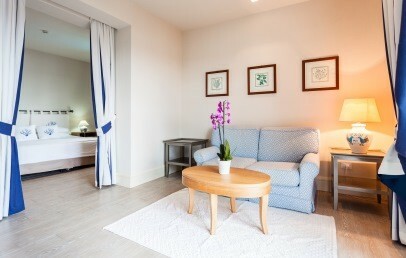 The hotel's common spaces and wellness facilities are available free of charge (treatments and massages are payable). Wi-Fi connection is complimentary. Guests can take advantage of the many activities available locally: trekking, tennis, scuba-diving, windsurfing, kite surfing, sport fishing, golf. City tax – the municipality of Golfo Aranci requires the payment of € 2.00 per person/overnight, to be paid on-site. Comfortable and welcoming, the Classic rooms are furnished in the traditional Sardinian style and have a picture window overlooking the pool, the garden and the sea. 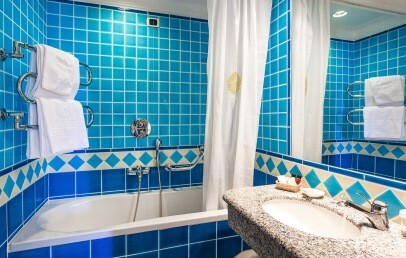 The bathroom can have tub or shower. 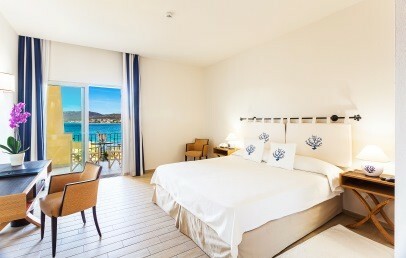 Comfortable and welcoming, the Deluxe rooms are furnished in the traditional Sardinian style and can have one or two double beds. 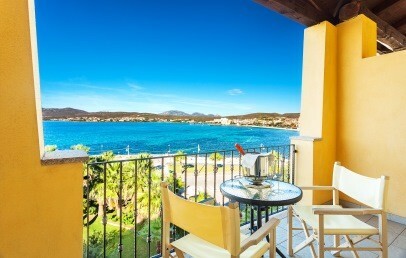 They have a picture window overlooking the pool, the garden and the sea. The bathroom can have tub or shower. Stylish and welcoming, the executive rooms are on the upper floors, have a wide balcony and offer a stunning panoramic view. The bathroom can have tub or shower. 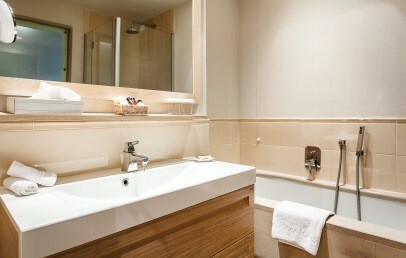 The Spa Executive rooms offer the luxury of a relaxation holiday to be enjoyed in the privacy of one's own room. 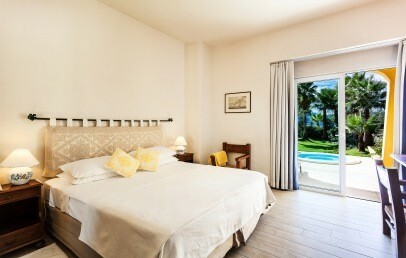 Each room has a large terrace with small private hydro-massage pool. On the ground floor, they have a view of the garden and sea. The bathroom can have tub or shower. Spacious and welcoming, the Junior Suites comprise a double bedroom with queen size bed and a separate living room with sofa bed. Junior Suites, with balcony with a view of the sea and garden, are the ideal choice for families or guests preferring spacious accommodation. The bathroom can have tub or shower. 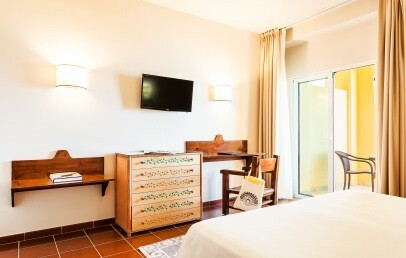 Comfortable and welcoming, the Deluxe rooms are furnished in the traditional Sardinian style. They have a picture window overlooking the pool, the garden and the sea. The bathroom can have tub or shower. Baby cot free of charge when requested in advance upon reservation.